Each week, I propose to point you to a selection of documentary films that might be of interest which you can play directly from the internet. I will copy the description of the film so you can see if it takes your fancy. To start off, here is one about cows. If you've ever wondered what cows are really thinking, then you might find The Private Life of Cows interesting. Humans have co-existed with cows for so long that most of us take them for granted, even though our demand for the meat and dairy products they produce continues to grow. The majority of us probably believe that all cows are the same, and that they're one of the least intelligent species on the planet. The filmmakers seek to challenge these preconceptions by conducting a series of intriguing behavioral tests. One Man, Six Wives and 29 Children tells the revealing and surreal story of a practicing polygamist who lives with his large brood in the middle of a Utah desert. The filmmakers document the family's daily existence, and probe the controversial aspects of the fundamentalist Mormon faith which define their way of life. Even after more than four thousand years, the Pyramids in Egypt continue to inspire awe and wonderment for their sheer size, complexity, and the lingering questions and myths regarding the manner in which they were constructed so long ago. With no record of how they were originally constructed, much work has been done to untangle these mysteries, and researchers have arrived at a series of probable conclusions. These revelations form the basis for the new Naked Science documentary Pyramids. The quest to unlock the mysteries of the mind lies at the heart of the documentary The Lucid Dreamer. Following committed Buddhist and teacher Charlie Morley, the film explores our capacity to maintain awareness during our deepest sleeping state, and how this practice may reap enormous benefits that we can then carry into our waking lives. In the past I dislike the documentary series.now when I start to listen to historic stories,I find it very amazing since then I'm interesting about theses topics.I watch film about the second world war,Islamic dynasty. It's always good to watch this type of programme. I also enjoy watching things like that when they have been made in other countries, too, as it means that you can get the same story but from another angle, which is always interesting. I have already watch One Man, Six Wives and 29 Children.it's strange for me,I can't believe that man could marry a women and his daughter. It's very strange @mouna. I don't have a problem about a man marrying more than one wife, but within reason! In Tibet, women used to commonly have several husbands, who were usually brothers. It is not so common now. Then in Nepal I know a few guys with more than one wife, but that's plain bigamy and usually because they want a visa to stay in another country! Exactly.more than one wife is common in many societies.for us a man could married to 04 wives if there are a strong reasons and only If he could get their several needs(physical,mental,and sexual),he have to treat them with the same way,He don't have to make any difference between them. Women who has several husband in the same time don't exist in our society. I think as long as the husband is kind and looks after all of his wives well and equally, then this could be very nice, especially if the wives get along. You might find this map interesting. 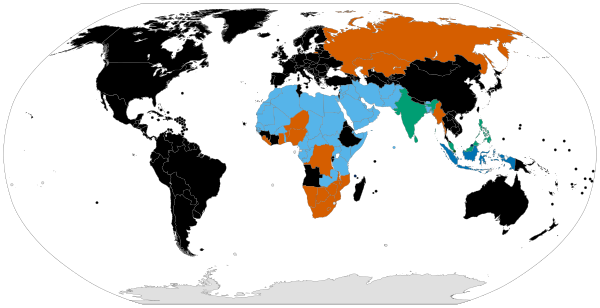 The dark blue area (mainly Russia) consider polygamy illegal although it is still widely practiced. However in many parts of Africa it is practiced and legal too. I consider that polygamy is not good behavior. First how one man can support two or more wifes and families. Second I consider that he will not treat all wives equally. Third I can`t imagine how wife could stand thinking that her husband is at the time with other woman. For me that situation is sick. I also doesn't​ support polygamy but one of our mythological book has shown polyandry. Dropadi have to marry all five brothers of Pandav because of certain reason. But it's not something justified in our system as well. In today's time you must be married to one spouse.Especially, for the country like India. We are already much populous. And this kind of thing will boost population. There is also some very hot debate going on on triple talak(divorce ) ( a flaws in the Indian constitution for appeaseing Muslims population). There was several cases happen with married Muslim women that was picked by Indian media where spouseof the woman have given divorce by saying three golden word on WhatsApp. The women activist says this kind of act makes the condition of women more vulnerable. Everyday there is some debate going on in this issue. Yes, I think it can work in certain cases, but I can't imagine it ever working in a country like England - because I think most people here have a jealous streak, which definitely wouldn't work. I agree @GemmaRowlands in certain circumstances it might work. @Wirginia has a point though as I'm sure that it many cases wives will feel they're not treated fairly and I think may get jealous. > Yes, I think it can work in certain cases, but I can't imagine it ever working in a country like England - because I think most people here have a jealous streak, which definitely wouldn't work. "I don't know but I've been told" that in England some men of Muslim heretage marry and divorce several women without splitting de-facto. The ex-wives collect child benefits on which all the people live. The gluten issue is a very interesting one. I think it makes sense though that our bodies should only really be eating naturally existing foods like meat, fruit and vegetables - because they're not made to eat manmade food! > You might find this map interesting. The dark blue area (mainly Russia) consider polygamy illegal although it is still widely practiced. Well, the original Wikipedia's article states that polygamy in Russia is "not criminalised" instead of "widely practiced". In fact, here it's not widely practiced. In North Caucasusian traditionally Muslim provinces (but not all of them) maybe, but even there it's not widespread. It can't be even theoretically, supporting several wives is very expensive, few people could afford it. Anyway in Russia one can't register a polygamous marriage, while living in such marriage isn't a criminal offence. I think @GemmaRowlands point that jealousy might make marrying several wives less than easy is a valid one that doesn't just apply to the UK @Practical_Severard. I was surprised about Russia as I wasn't aware of the practice being acceptable there. I wasn't surprised to see most of Africa shaded in blue however. I was surprised about Russia as I wasn't aware of the practice being acceptable there. If 'acceptable' means that polygamy isn't a criminal offence then it's quite true. In Britain bigamy is a criminal offence as most western countries do not recognize polygamous marriages. Quite a few countries also prohibit people from living a polygamous lifestyle like in some states of the USA where the criminalisation of a polygamous lifestyle started out as anti-Mormon laws even if rarely enforced. In diplomatic law, consular spouses from polygamous countries are sometimes exempt from a general prohibition on polygamy in host countries. Penalties in different countries vary (https://en.wikipedia.org/wiki/Bigamy) but in all 27 countries of the EU it is illegal, though as usual, Britain has to be different and polygamous marriages that are legally performed in another country where the law allows it are legally recognised for the purposes of welfare benefits, but not for pension, immigration or citizenship purposes. It is believed that there are up to 20,000 polygamous marriages in the Muslim community of the UK. > In Britain bigamy is a criminal offence as most western countries do not recognize polygamous marriages. If someone has a long-time lover besides a legal spouse will it be a criminal offence? Or there must be two legally registered marriages? As long as they don't get married, mistresses seem to to okay @Practical_Severard! Oh, don't narrow it down to men only I think women should be also allowed their lovers. Equality! Quite right too @Practical_Severard. In Tibet women sometimes have a few husbands particularly when they live a nomadic lifestyle. The husbands take turns being at home! > The husbands take turns being at home! Those wives are cheating. Two husbands must come with the double rate of household chores. Cooking, ironing business suits of those Tibetian gentlemen, etc. Well usually they are brothers and the woman marries two or three husbands because they often are out and away herding animals or working elsewhere. I can imagine it must be a bit tricky juggling things if they are all home at the same time though @Practical_Severard. > I can imagine it must be a bit tricky juggling things if they are all home at the same time though @Practical_Severard. Now you can see that bigamy is a harsh punishment by itself, therefore we, here in Russia, consider a criminal penalty pointless. Several wives mean buying several furcoats, sets of jewellery, and, the most frightening thing, several mothers-in-law. Hahaha! Poor old mother-in-laws! They always get it in the neck. Do you remember the topic on jokes about the in laws @Practical_Severard?